Subsurface tile drainage is an essential agricultural water management practice on many highly productive soils in the Midwest. However, nitrate carried in drainage water can lead to local water quality problems and contribute to hypoxia in the Gulf of Mexico, so strategies are needed to reduce the nitrate loads while maintaining adequate drainage for crop production. The term "conservation drainage" has been coined to describe practices that can reduce nitrate loads on tile-drained soils, including modifying drainage system design and operation, woodchip bioreactors, and modifications to the drainage ditch system. This web site provides information that has been developed by university extension specialists and researchers to inform farmers, agency staff, decision makers, and others about these practices. 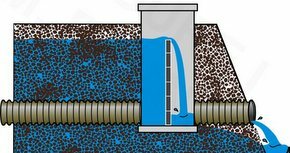 Drainage water management is the practice of using a water control structure in the main drain to raise the drainage outlet to various depths. This allows farmers to have more control over drainage. Praesent auctor quam quis libero venenatis dapibus. Donec ullamcorper feugiat nunc. Nullam ut neque neque. Suspendisse ac commodo libero. Sed aliquam mauris vel mi feugiat interdum. Etiam ut nibh et urna cursus ultricies nec vel nunc. In hac habitasse platea dictumst. In pretium eleifend arcu, sit amet faucibus nunc egestas ac. Etiam ut nibh et urna cursus ultricies nec vel nunc. In hac habitasse platea dictumst. Donec ullamcorper feugiat nunc ut tempus. Sed sodales, nibh ut ultricies pulvinar.